Nancy P. Alexander is an award winning professional trainer, the executive director of Northwestern State University Child and Family Network, and president of the North Louisiana Chapter of the American Society for Training and Development (ASTD). She is a nationally recognized speaker and workshop leader in early childhood programs. She has been an active participant in the National Association for the Education of Young Children (NAEYC), Southern Early Childhood Association (SECA), and Louisiana Early Childhood Association Annual Conference, among many other regional and national conferences. Now anyone involved in the professional development of others in early childhood can prepare a full year of high-quality meetings and experiences. 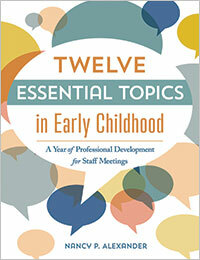 Twelve Essential Topics in Early Childhood includes an agenda and outline for each topic, along with a materials list, handouts, instructions for activities, a CD-ROM with twelve customizable PowerPoint presentations and reproducible forms, as well as certificates of completion.